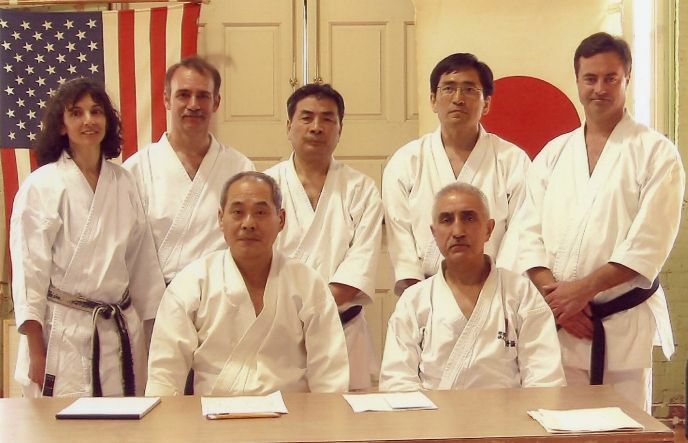 Some of Shotokan Karate-Do International's Senior Instructors at Spring Training Camp, April 2003. Seated: Masataka Mori (Chief Instructor SKDI, 8th dan), Ahmad Mazhari (Chief Instructor, JKA Virginia, 5th dan). Standing: Margaret Thomas (Asst Chief Instructor, UConn Karate Club, 5th dan), Doug Luft (Chief Instructor, JKA Albany, 6th dan), Shu Takahashi (Asst Chief Instructor, SKDI, 7th dan), (Eiji Toryu, Chief Instructor, JKA Boston, 5th dan), Bob Jacobs (Chief Instructor, UConn Karate Club, 5th dan).